^ 「ガルッスがエジプト総督であった時代、私は彼に同行してナイル川を遡り、エチオピアとの国境近くのアスワンまで赴いた。私は120あまりの船がミュオス・ホルモス（注：紅海最奧に位置するエジプトの港町）からインドへ向かう予定だと知った。以前のことだが、プトレマイオスの治世下で、一度だけ、わずかな危険を冒してインドの交易品を船で運んだことがある。」（ストラボン II.5.12. ); The Geography of Strabo. Vol. I of the Loeb Classical Library edition, 1917..
Dalby, Andrew (2002). Dangerous Tastes: The Story of Spices. Berkley: University of California Press. ISBN 0520236742. Fage, John Donnelly; et al. (1975). The Cambridge History of Africa. Cambridge University Press. ISBN 0521215927. Freedman, Paul (2008). Out of the East: Spices and the Medieval Imagination. New Haven: Yale University Press. ISBN 0300151357. Keay, John (2006). 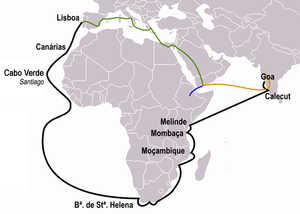 The Spice Route: A History. Berkley: University of California Press. ISBN 0520254163. Krondl, Michael (2007). The Taste of Conquest: The Rise and Fall of the Three Great Cities of Spice. New York: Ballantine Books. ISBN 0345480848. Miller, James Innes (1969). The Spice Trade of the Roman Empire. Oxford: Oxford University Press. ISBN 978-0198142645. Morton, Timothy (2000). 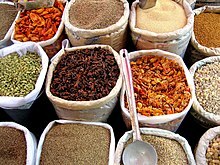 Poetics of Spice: Romantic Consumerism and the Exotic. Cambridge: Cambridge University Press. ISBN 9780521026666. Schleif and Schier, Corine and Volker (2009). Katerina's Windows: Donation and Devotion, Art and Music, as Heard and Seen through the Writings of a Birgittine Nun. Penn State Press. ISBN 9780271033693. Turner, Jack (2004). Spice: The History of a Temptation. New York: Alfred A. Knopf. ISBN 0375407219.